For the tenth year, the North Market has gathered a collection of Ohio’s finest wineries to celebrate fine local cuisine and vino at the North Market Food & Ohio Wine Festival Presented by PNC. The festival will take place the weekend of July 8-10. Sponsoring organizations include PNC Bank, Ohio Grape Industries, Master Clean, Columbus Alive, Columbus Crave, Ohio Magazine and YELP. The Food & Ohio Wine Festival will kick-off on Friday night with a special preview party from 7-10 p.m. Tickets to the event are $20 and include a commemorative wine glass, 10 tasting tickets and $5 in Market bucks to spend with market merchants. Proceeds benefit the historic North Market. Columbus celebrities will serve as guest pourers for the wineries. Taking the stage Friday night will be Columbus natives Grace Adele and her Grand Band. The group will be visiting from Nashville where they are endeavoring to break into the music business. The following wineries from around Ohio will offer select wines by the 2 oz. taste ($1.00 to $4.00 each), glass, bottle and case: Brothers’ Drake Meadery, Columbus; Chalet Debonne Vineyard, Madison; Ferrante Winery, Geneva; Firelands Winery, Sandusky; Henke Winery, Cincinnati; Laurello Vineyards, Geneva; Maize Valley Winery, Hartville; Markko Vineyard, Conneaut; Meranda-Nixon Winery, Ripley; Mon Ami Winery, Port Clinton; Raven’s Glenn Winery, West Lafayette; Soine Vineyards, Powell; St. Joseph Vineyards, Thompson; Stoney Ridge Winery, Bryan; Troutman Vineyards, Wooster; The Winery at Wolf Creek, Norton; Valley Vineyards, Morrow; Viking Vineyard, Kent and Wyandotte Winery, Columbus. Throughout the weekend there will be live music on two stages and cooking demonstrations. Chefs from local restaurants and North Market merchants will conduct the demonstrations and samplings. Additional activities include the Saturday Farmers Market and a Sunday marketplace featuring local artisans and Ohio Proud vendors. Festival hours are Friday, July 8, 7-10 p.m., Saturday, July 9, 11 a.m. – 8 p.m. and Sunday, July 10, 12 – 6 p.m. Preview Party admission is $20. Saturday and Sunday admission is free. A $5 tasting fee on Saturday and Sunday includes a souvenir glass with tasting tickets available for purchase in any quantity for $.50 apiece. 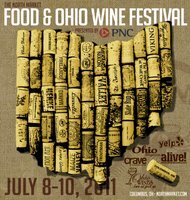 For additional information on the North Market Food and Ohio Wine Festival, please call 614-463-9664. Festival Hours, 11 a.m.–8 p.m.